(Nanowerk News) The structural materials that are currently used to construct homes, buildings, and infrastructure are expensive to produce and transport, wear out due to age and damage, and have limited ability to respond to changes in their immediate surroundings. Living biological materials—bone, skin, bark, and coral, for example—have attributes that provide advantages over the non-living materials people build with, in that they can be grown where needed, self-repair when damaged, and respond to changes in their surroundings. The inclusion of living materials in human-built environments could offer significant benefits; however, today scientists and engineers are unable to easily control the size and shape of living materials in ways that would make them useful for construction. 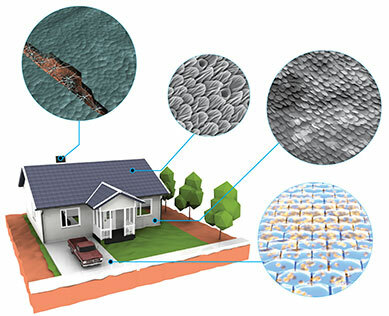 DARPA is launching the Engineered Living Materials (ELM) program with a goal of creating a new class of materials that combines the structural properties of traditional building materials with attributes of living systems. Living materials represent a new opportunity to leverage engineered biology to solve existing problems associated with the construction and maintenance of built environments, and to create new capabilities to craft smart infrastructure that dynamically responds to its surroundings. Grown materials are not entirely new, but their current manifestations differ substantially from the materials Gallivan envisions. For instance, biologically sourced structural materials can already be grown into specified sizes and shapes from inexpensive feedstocks; packing materials derived from fungal mycelium and building blocks made from bacteria and sand are two modern examples. And, of course, wood has been used for ages. However, these products are rendered inert during the manufacturing process, so they exhibit few of their components’ original biological advantages. Scientists are making progress with three-dimensional printing of living tissues and organs, using scaffolding materials that sustain the long-term viability of the living cells. These cells are derived from existing natural tissues, however, and are not engineered to perform synthetic functions. And current cell-printing methods are too expensive to produce building materials at necessary scales. ELM looks to merge the best features of these existing technologies and build on them to create hybrid materials composed of non-living scaffolds that give structure to and support the long-term viability of engineered living cells. DARPA intends to develop platform technologies that are scalable and generalizable to facilitate a quick transition from laboratory to commercial applications. The long-term objective of the ELM program is to develop an ability to engineer structural properties directly into the genomes of biological systems so that neither scaffolds nor external development cues are needed for an organism to realize the desired shape and properties. Achieving this goal will require significant breakthroughs in scientists’ understanding of developmental pathways and how those pathways direct the three-dimensional development of multicellular systems. Work on ELM will be fundamental research carried out in controlled laboratory settings. DARPA does not anticipate environmental release during the program. Full details of the ELM program’s objectives and deliverables can be found in a Broad Agency Announcement. DARPA is hosting a Proposers Day on August 26, 2016, in Arlington, Va., to further clarify the program vision and answer questions from potential proposers. Advance registration is required.